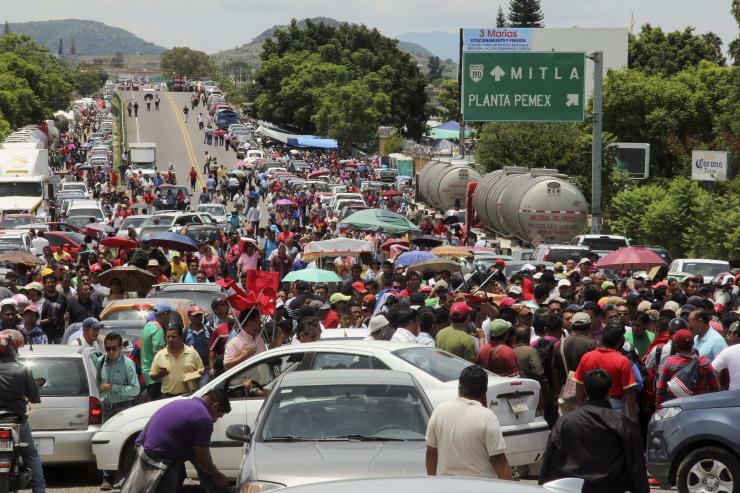 Oaxaca teachers block access to Pemex (the state-owned oil company) facility. Pursued by the public ridicule provoked by El Chapo Guzmán’s escape, the uneven devaluation of the peso, the stagnant economy, the failure of the first oil round and by the incessant violation of human rights, the government of Enrique Peña Nieto decided to spread a cloud of smoke over its misfortunes and go ahead with giving a slap on the hand to Oaxacan teachers. As if the teachers were a threat to national security, the Los Pinos  blitzkrieg moved thousands of uniformed forces to Oaxaca: 4,000 federal police, three brigades of military police with 660 members each, besides the 4 thousand soldiers from the Military Zone. As if it was nothing, they occupied public buildings and strategic infrastructures, flew helicopters over the state’s capital, illegally froze the bank accounts of the teachers’ union and of some of its leaders and hung the sword of Damocles (possible detention) over their heads. On the way, it disappeared by decree, without any notification, the State Institute of Public Education of Oaxaca (Ieepo, its initials in Spanish) and unilaterally broke the promises that regulated labor and professional relations between the state government and the teachers. The Ieepo is the equivalent of the secretariats of Education that exist in other states. It was created in 1992, during the government of Heladio Ramírez, within the framework of the signing of the National Agreement for the Modernization of Basic and Normal  Education (Anmeb), impelled by then President Carlos Salinas in order to try to resolve the problems of gigantic growth and bureaucracy in the Secretariat of Public Education (SEP). Despite the fact that the Section 22 teachers opposed the federalization of teaching, they accepted the institute’s formation as a decentralized organism. On October 28, 1992 they signed the principal memorandum. It is false that it (Section 22) has taken power over the institution. The governor always designated the institute’s director and its board of directors. The teachers chose some of the mid-level directors, with academic and professional criteria. Los Pinos presents the disappearance of the old Ieepo as the measure that would allow the state government to recover the rectory of education. That is false. It already lost it to the hands of the federal government. In fact, the new organism abrogates the federalization of education and inserts its leadership group into the SEP. On the way, it incorporates into its leadership people as well informed in educational issues as the secretaries general of Government, Health, Finances, Administration, Social Development, Cultures and Arts, Comptroller and Transparency. Ironic of the education reform, the director of the new Ieepo is the same one that was at the front of the old Ieepo since October 2014: Moisés Robles Cruz. Formed as a lawyer, a member of the group close to ex governor Diódoro Carrasco –with whom he collaborated as coordinator of Documentation and Management Control of the office when he was Secretary of Governance–, the one now responsible for basic and normal public instruction of Oaxaca is ignorant of the world of pedagogy. More than heading up teaching, his trajectory is qualified for being chief of police: he was an agent of the Public Ministry in the Oaxaca State Attorney General of Justice and, afterwards, director general of Legal Issues for the Federal Police, in times of the ineffable Genaro García Luna. According to the government’s media campaign, the representation of the leaders Section 22 comes from, not from the mandate of its bases, but rather from the alleged control that they have over the Ieepo. They have spread the idea that the strength of the National Coordinator Nacional of Education Workers (CNTE) depends exclusively on Oaxaca. And, on the way, they have made illusions to the fact that, starting with the blow at hand against the Oaxaqueños, protests in the rest of the country will stop. But that’s not going to happen. The blitzkrieg will not stop teacher discontent on a national scale. The current uneasiness of the teachers is not limited to the CNTE, nor is the strength of the Coordinator (CNTE) constrained to Oaxaca, although its most consolidated contingent is there. It’s false that the legitimacy of the leadership of Section 22’s education workers depends on their influence on the Ieepo. The democratic movement in the state emerged in May 1980. Between 1980 and 1992 –the date on which the Ieepo was formed– it acted on the state and national political scene with much vigor and capacity to convoke. It did that despite the fact that, at different times, it did not have formal representation, because, between 1985 and 1989, Carlos Jonguitud was opposed to the realization of its congress. The union did not have one cent of union dues for moving. And, despite that, it continued acting and it was a headache for the governors. Having or not having Institutional support was not an impediment to protest. The current leadership of the union in Oaxaca is transitory; in fact, all of them have been ever since the first democratic committee was named in 1982. No representative is re-elected. At the end of their period in union office, they return to their school. Throughout the 35 years of life that the movement has, it has formed hundreds of leaders. Putting some of them in prison can be a misfortune, but it doesn’t decapitate the organization. Oaxacan teachers have a political culture of struggle many decades long. It was nourished in part and developed through centuries of resistance from the indigenous communities. Their actual behavior has little to do with the caricature that the power has made of their movement. It knows how to advance and recede, to pressure and to negotiate intelligently. The police and the Army are now in Oaxaca. How much time will they be able to stay in the state? It’s vacation season. Are they going to send a gendarme to each one of the schools when classes resume? The government has a lot of fronts to attend. It cannot concentrate forces there indefinitely. This movement has 35 years of life. And has survived everything that it has wanted to do. The party’s not over. Los Pinos (The Pines) is Mexico’s presidential residence, like the White House is in the United States. A “normal” in Mexico means a rural teachers college, like Ayotzinapa.